Saturday we worked in the yard, pulled some of the endless weeds, I managed to get yet another surprise sunburn, he studied and I worked on more jewelry and some fun new items (again, more coming on them later). All in all it felt like we had a very productive Saturday so a nice datey night out was called for. We decided to walk over to the old ‘hood on SE Belmont; we stopped and visited the goats, we scouted out all the good yards looking for some plant inspiration for our yard, we had some super-fantastic Lebanese and then ended the night a $3 movie at the Avalon. A pretty fantastic evening. 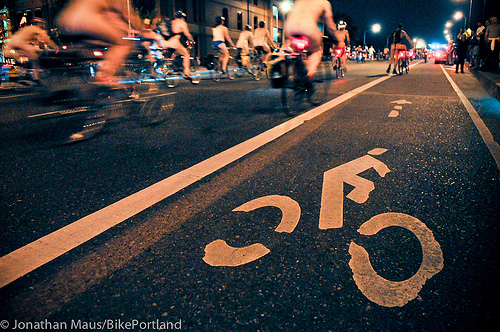 The month of June is Pedalpalooza here in Portland. A month-long celebration of all things biking. There is an organized ride for pretty much every group of people you can think of: Star Wars Junkies, Wine Enthusiasts, Super Hero Lovers, Families, Buddhists, Food Truck followers, even Gingers. The biggest ride of them all is by far the World Naked Bike Ride, which just happened to have been taking place Saturday night… right down Belmont… just as our movie was ending. Not that I am bothered by this, I actually took part (well as close I think I may ever get to taking part) last year with a friend of mine (I wrote about it here). I was just caught off guard and then was trapped, unable to cross the street due to the sheer amount of bikes and bare flesh flying past me. It was pretty impressive, people’s inhibitions and also their ingenuity when it comes to costuming while still remaining naked. Impressive on all fronts. Just another reason why I love Portland.